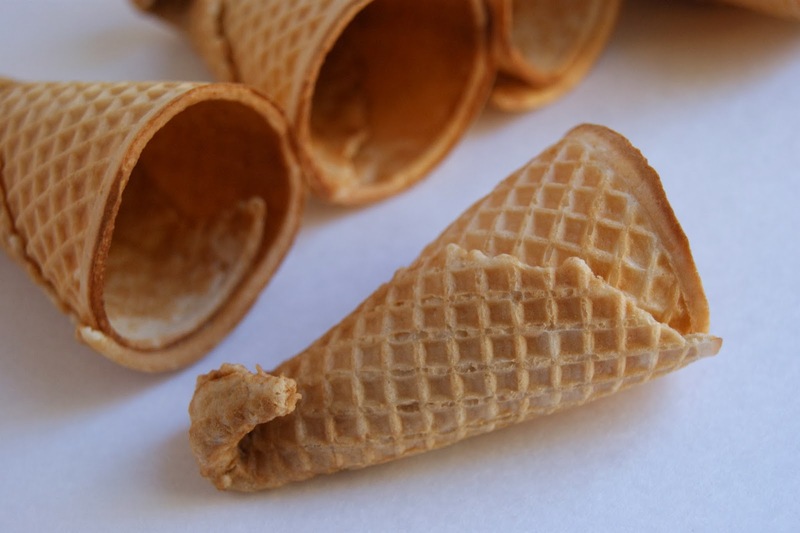 Who in the world ever thought that heating and reshaping ice cream cones was a good idea? Hmm? 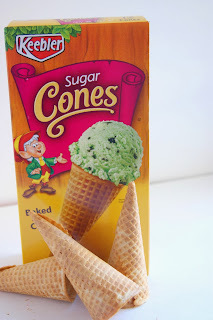 Who put all those sugar cone cornucopias on Pinterest with the 'easy and quick to make' comment on them? I'd like to know who! 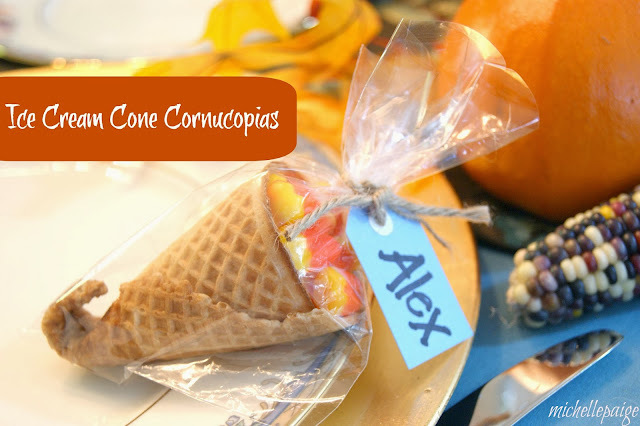 Those 'cute' sugar cone cornucopias are not easy and are sure not quick! Cute is questionable right now. 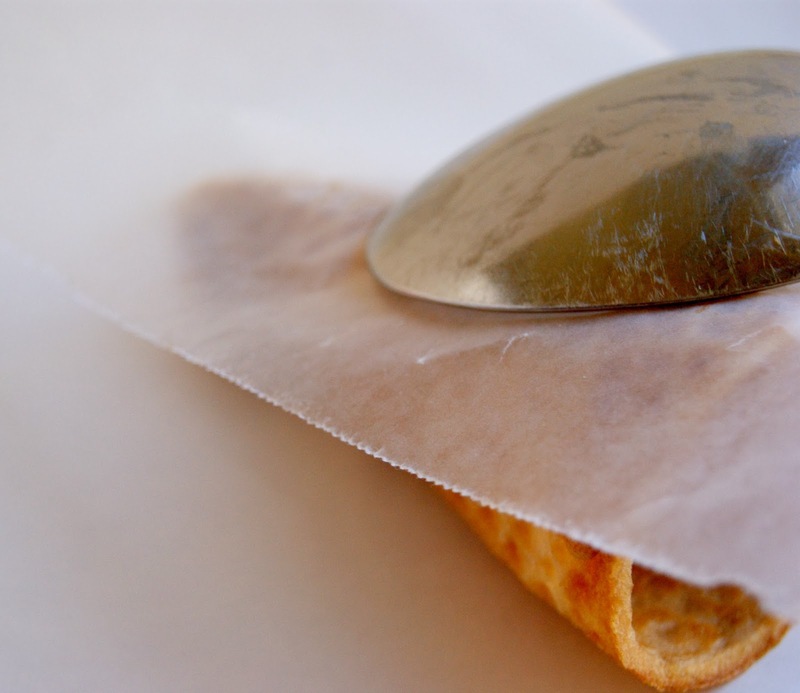 If you think you're game and up for a sticky challenge, read on. 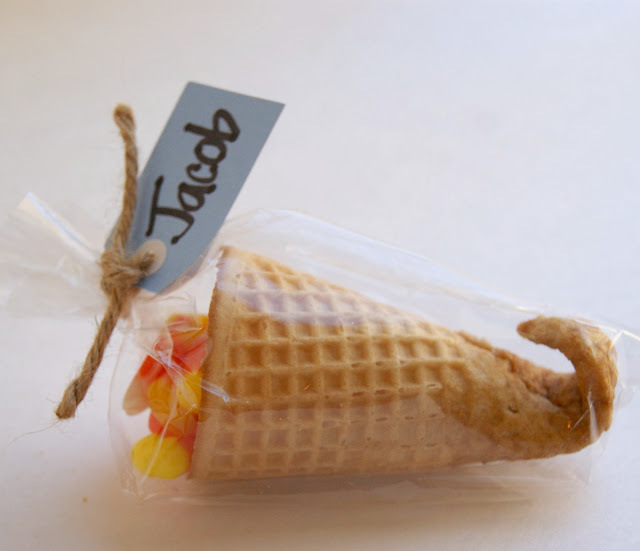 Start with sugar cones. Cheap or expensive--I tried different brands and they all work the same...not too well. 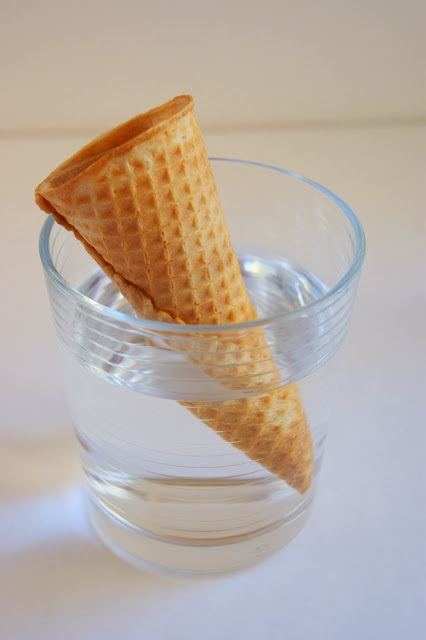 Dip the bottom of the cone in water for 20 seconds, then heat the cone in the microwave for 15 seconds. 15 seconds in the microwave. The cones turn into a sticky mess. Other tutorials say to wrap the ends around a pencil. Well, I tried that and then I had a dozen sticky, gooey pencils to deal with. It didn't work too well. 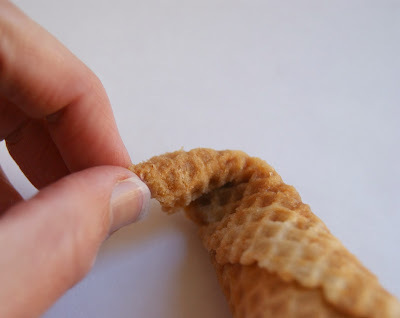 My advice is to use your fingers (yes, they'll get sticky) and roll up the end of the cone yourself. Place the cone (curled-side down) on a sheet of waxed paper. 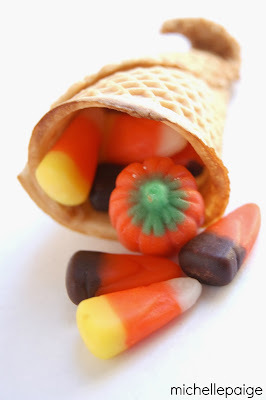 The cones will immediately want to roll and uncurl. Cones do not want their ends to be rolled up and certainly do not want to dry flat on the counter for ease...I mean, really. After much trial and error and frustration...I finally gathered big spoons and 'weighted' each cone down with the pressure of a spoon. You'll need quite a bit of counter space to pull this off...just saying. 24 hours later! Yes, I cooked dinner, made lunches and did dishes around these cones. No way was I going to move these. 24 hours later I had 'fairly' cute cornucopias. However, do you notice that the part that was dipped in water dried a darker shade? Ugh. I'm pretty sure this will be the first and last time these cornucopias will make a showing at our Thanksgiving table! Hope the kids like them. I wonder how the pilgrims did this? Honesty is the best policy. Thank you Michelle for your candid alert to us all! And Happy Thankgiving! Thank you for your transparent warning for us all! And Happy Thanksgiving to the whole fam. I know someone who tried this, and ditched the sugar cones for waffle cones, since she too was having trouble getting them to curl.